90 days warranty by Microsoft. Experience the action like never before with the Xbox One Controller + Cable for Windows. Redesigned thumb sticks and an all new D-pad provide greater precision. Enjoy the reliable wired connection to your PC – and forget about replacing batteries. 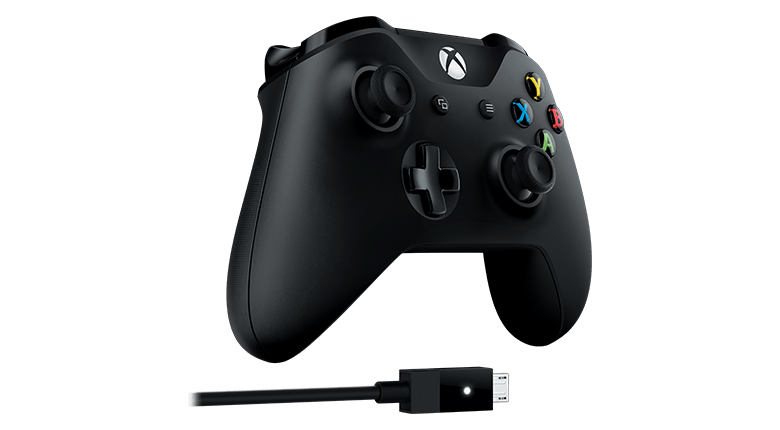 The Xbox One Controller + Cable for Windows can be used as wired or wireless on your Xbox One. Works across Microsoft's gaming platforms. Connect with wire on your PC. Play wired or wirelessly on your Xbox One delivering flexible gaming experience. Enjoy a powered and reliable connection with a wired controller.No need to change batteries. Experience the enhanced comfort and feel of the new Xbox Controller, featuring a sleek, streamlined design and textured grip. Enjoy a secure gaming experience through direct USB connection between the controller and your PC. Plug in any compatible headset with the 3.5mm stereo headset jack. And, with Bluetooth® technology, you can play your favorite games on your mobile devices cable-free*.